City of Ephraim, where were placed, after the settlement in Palestine, the Ark and the sanctuary of Yhwh at which the family of Eli officiated (I Sam. i. 3 et passim, iii. 1 et seq.). 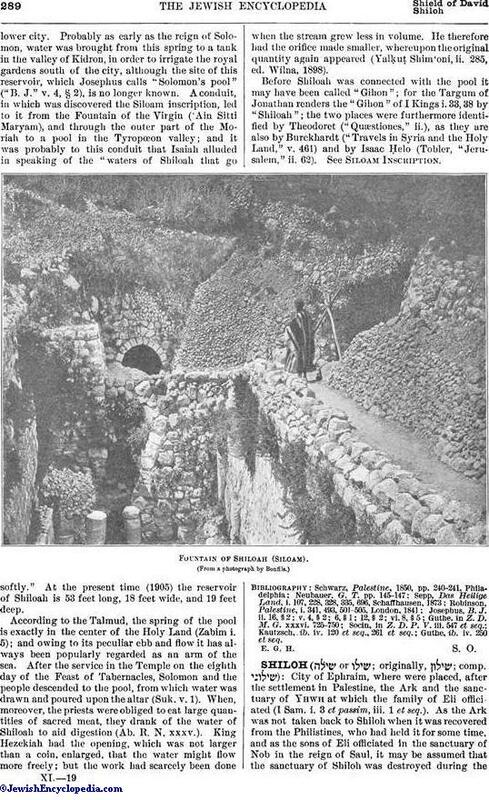 As the Ark was not taken back to Shiloh when it was recovered from the Philistines, who had held it for some time, and as the sons of Eli officiated in the sanctuary of Nob in the reign of Saul, it may be assumed that the sanctuary of Shiloh was destroyed during thewar with the Philistines (comp. Jer. xvii. 12, 14; xxvi. 6, 9). According to the Priestly Code, the tabernacle was set up at Shiloh (Josh. xviii. 1), which consequently became the religious center for the entire people, where the land was allotted and where the congregation assembled (Josh. xviii. 8 et seq., xxii. 12; Judges xxi. 12). From there the women were carried off by the Benjamites during the autumn festival. Subsequently Shiloh is mentioned only as the home of the prophet Ahijah (I Kings xi. 29 et al.). It is described in Judges xxi. 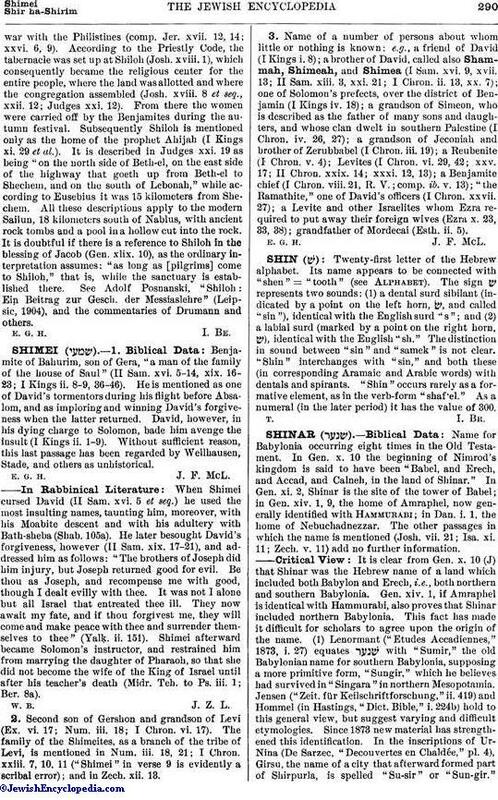 19 as being "on the north side of Beth-el, on the east side of the highway that goeth up from Beth-el to Shechem, and on the south of Lebonah," while according to Eusebius it was 15 kilometers from Shechem. All these descriptions apply to the modern Sailun, 18 kilometers south of Nablus, with ancient rock tombs and a pool in a hollow cut into the rock. It is doubtful if there is a reference to Shiloh in the blessing of Jacob (Gen. xlix. 10), as the ordinary interpretation assumes: "as long as [pilgrims] come to Shiloh," that is, while the sanctuary is established there. See Adolf Posnanski, "Shiloh: Ein Beitrag zur Gesch. der Messiaslehre" (Leipsic, 1904), and the commentaries of Drumann and others.